If the joint replaced was the only joint affected by arthritis, no further anti-inflammatory tablets will be required once the initial post-operative discomfort settles. If other joints are affected or you suffer from rheumatoid arthritis, the tablets may be restarted, if possible after an interval of 2 to 3 weeks. Pain killers may be taken during this time before anti-inflammatory tablets are restarted. The day following surgery the physiotherapist will get you out of bed to commence walking with the help of crutches or a walking frame. The machine will be removed increasingly for you to perform your quadriceps exercises. After the first few days the range of motion pre-set on the continuous passive motion machine will be increased. The physiotherapist will also begin to encourage you to bend the knee. Sitting over the side of the bed may assist. The early exercises and mobilising of the knee will cause some discomfort and swelling. However, this is normal and is just the healing process occurring. Any swelling or discomfort in the calf muscle should be brought to the attention of the nursing staff or after discharge, to your general practitioner. 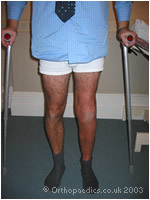 After 5-10 days usually you are able to walk with minimal or no pain, with the assistance of sticks, crutches or a frame. You should be able to manage stairs with the assistance of a banister, and to care for yourself around the home. When this is possible you will be discharged from hospital. Whilst at home the exercise program of quadriceps exercises should be vigorously continued. Approximately 10 minutes each hour will be ample. Out patient physiotherapy sessions should be arranged during this period. Resisted exercises and training may be undertaken if desired after 6 weeks; this would be beneficial. The progress is a little slow at this stage. If the knee becomes more swollen or more painful than during the first day, please return to your general practitioner for early review. Prior to discharge from hospital the ward staff on behalf of Mr. Johnson will usually provide an appointment for review by Mr. Johnson after 4-6 weeks. Modern techniques and technology ensure that the complication rate is minimal. Beside the anaesthetic risks, which are very low, infection that involves the joint is less than 1:100. This would present as the knee becoming hot, swollen, throbbing and painful after 2-4 days, or alternatively at any period thereafter. Venous thrombosis is in the order of 1:50. To avoid thrombosis anti-coagulant therapy will be given for a short period after the operation. Thrombosis presents with a swollen, tender calf muscle, or intermittent pain in the chest on deep breathing. There is a risk to the major vessels and nerves of the knee, but this is very rare. Stiffness sometimes occurs and a further manipulation is necessary. If any of these or any other complications arise, inform the nurses or your Surgeon if still in hospital or your General Practitioner if at home. 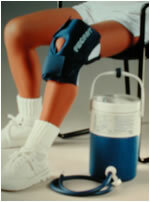 Generally, the results of knee replacement are excellent and as good as or better than hip replacement. I expect that a knee replacement should, if cared for, last 15 years in over 90% of patients. In uni-compartmental replacement there is the additional factor in that the remaining parts of the knee, which have not been surgically replaced, may suffer from progressive arthritis. This may result in further surgery becoming necessary after some time. After joint replacement, in order to avoid infection of the new joint, all infections or dirty wounds must be adequately treated with antibiotics. This includes any urinary infections or severe chest infections. Any further surgery must be covered by a short period of antibiotic therapy. This includes any dental treatment or urinary catheterisation. A yearly review should be undertaken by Mr. Johnson with an up-to-date x-ray. This is to ensure that the prosthesis is not becoming loose. Patients should contact Mr. Johnson's secretary to arrange this. If you move house please let the secretary know, such that we can remain in contact and follow-up can be arranged as necessary over the years. If your job is sedentary and mostly sitting you may wish to return after only 3 - 6 weeks. If your job is physically demanding and requires standing or walking for most of the day, your return to work may take several months. Driving can usually be performed after 4-6 weeks providing that the knee is pain free and you are able to control the car with foot pedals and make an emergency stop. Resisted exercises and training may be undertaken. This will speed up the rehabilitation and should be performed prior to undertaking more vigorous sports. Swimming is often possible after 3 weeks. Return to golf, gentle tennis or badminton may take 3 months. Jogging and squash is not advised. The first follow up appointment is usually arranged for 4 weeks after surgery and subsequently after some weeks or if progress is good a year later.